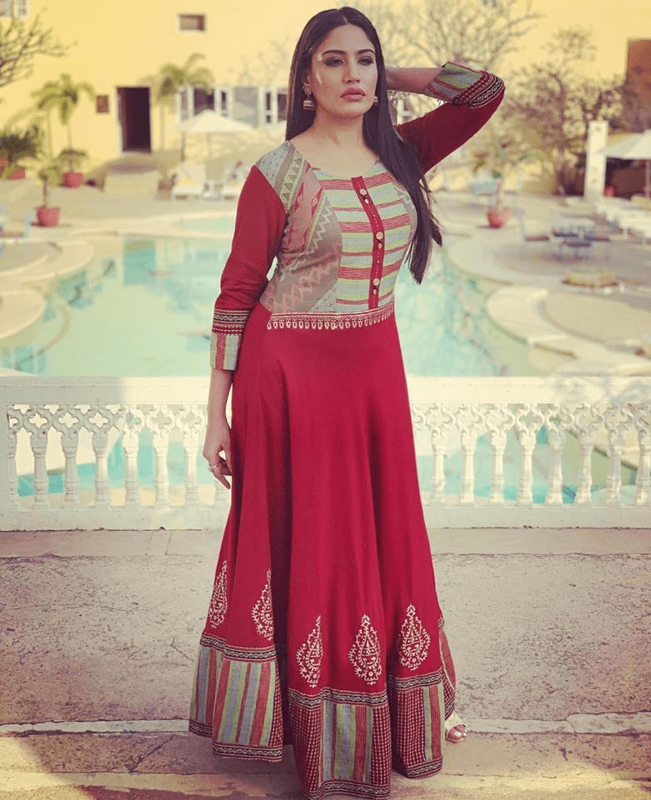 Talented actress Surbhi Chandna has global admirers who show unconditional love and follow her every move. The small screen actress regularly reciprocates that love and shares a very special bond with fans she sees as family. That is why Surbhi was happy to turn the tables on 20 fans to interview them. Those selected won a global Twitter competition organised by Eastern Eye and popular fan club @TeamSChandna and gave heartfelt answers with plenty of warm moments, including giving a better understanding of the special bond they share with Surbhi. “I loved reading the answers and it was like getting to know more about treasured family members,” said Surbhi. All the fans are my heroes. Who is your hero in everyday life? @Lovepreet_1990 – My heroes are my parents who love me unconditionally. I would have said I am my hero, but without my parents’ support, I’m nothing. My world revolves around my parents and I know if I am in trouble or need anything they will always be there. I am a big foodie, if I came to your house for dinner what meal would you prepare and would you be ready for an eating contest? @Shivii_Narbhi – I’m a Gujarati and if you come to my house for dinner, you will get tasty and spicy Gujarati food with lots of variety. I will prepare you famous Gujarati dishes and also my mom makes super delicious south Indian food. We will make sambhar, dosa and idli with tasty coconut chutney. I love to collect shoes. What about you? @WilhelminaMvula – I love this question just because I have a secret to share that no one actually knows about. I love to collect seashells. I collect them whenever I visit the shore. I like collecting them because it helps me keep count of how many times I’ve been to the sea, and also to decorate my room with them. I have more than 1,589 in my collection and I find them beautiful and unique. @titliispeaks – Thank you Surbhi for asking me this wonderful question. There are a lot of things around us, which are very inspiring. If I have to choose, it’s life that inspires me the most. Each challenge it throws at me, each hurdle I manage to surpass, each change that prompts me to adapt – it’s all very inspiring. But in terms of people, it would be my mother and you (Surbhi Chandna), who influence me positively to embrace my life as it is. I believe in having big dreams and ambitions. What are some of your impossible dreams? @Sirf_Varsha – My mom is in heaven with god and she stays in my heart. My impossible dream would be to sleep beside my mother and embrace her tightly to keep her with me forever. @SurbhiM019 – Hello Surbhi, I take advice from my parents. Their friendly nature helps me to discuss anything with them, be it personal or professional. What music do you most enjoy listening to? @umama_younus – I enjoy soulful, soothing, soft music the most. It helps me think better, be happier and even reduces my stress and calms me. It gives me a feeling of calmness that I need to figure out things and take the right decisions. The soulful, soothing music is like a companion in my hard times and I love it. My character went on quite a journey in Ishqbaaaz, what was your favourite part of that journey? @Goharraza2 – My most favourite part was when you played the role of Kumari Rosie Rani. You were so good in that role. You slayed each and every scene. The way your character talked and walked was really funny and unique. I enjoyed it a lot. Can you relate to any elements of characters I have played, if so, which one? @imaanmalik_x – I could write a whole essay on the one character I relate to the most. In short, I relate to Annika’s way of seeing life and finding positivity in everything. How Annika is always ready to take a stand on wrong things, her views of society, the way she empowered girls and the love for her family. Your every character inspires us. My mother always tells me what to do, who is always telling you what to do? @PalakBindra2 – My mother and sister tell me what to do and what not to do, but I’m too stubborn to agree with them every time. There is only a 20 per cent chance that I wholeheartedly agree or do what they say. But 50 per cent of the time I don’t agree with them and 30 per cent of the time they emotionally blackmail me and force me to do something. I like to travel and want to see the world, where would you love to travel to? @mrish1509 – I want to travel the length and breadth of India to know about its diverse culture and to learn different cooking tips. Also, would love such travel even more if Surbhi Chandna joins me. I like to laugh, tell me about something funny that has happened to you? @I_m_sreya_ – One day me and my friend and with our parents went ice-skating. We had fought with our parents to let us do it for at least an hour. And we entered the venue with a lot of confidence. We wore shoes and helmets and entered the ice rink. As soon as I stepped on the ice, I fell down and my clothes got wet. Everyone laughed. Then, as instructed, we started walking around the boundary like small kids trying to walk for the first time. Finally, we quit after 15 minutes. After that I decided to never go for ice-skating. I like fashion and enjoy experimenting with looks; which has been your favourite out of the looks I have tried? @sarubaby25 – Hi Surbhi, I love when you experiment with looks and my favourite is the recent one for the Summit Awards. Also, your looks for the latest award show were all super amazing. Love seeing you experiment with different looks and styles and being a super style advocate to your fans. I like to learn new things, what new thing do you think I should learn? @angel_nonu9 – Consider taking singing lessons to polish your skills as you have an amazing voice and perhaps learn dance forms such as kathak and bharatanatyam. It would be good if you had a YouTube channel, where you can post videos as it would be a great way to motivate fans. Which songs do you think I should add to my playlist? @Riaatweets – I love all genres and particularly enjoy instrumental as it gives me peace of mind. I would suggest you listen to good instrumental music. And my Bollywood playlist is filled with Arijit Singh. So would suggest you listen to his songs. I love you. I think fans have a lot of knowledge, so give me some advice? @munirah_Iam – Fans mostly carry a vision and express the way they want to see you. But, I feel there is really nothing I could advise you as you have a perfect family for guidance and support. All I can say and wish is that you stay grounded as always, no matter how high you go. Be unique and good. We are proud of you. Lots of love. If I acted in a movie, which leading man would you like to see me star opposite? @Shristi17505644 – I would love to see you with Ranveer Singh. Both of you have great energy levels and are extremely talented and hardworking. Both of you can make anyone cry or laugh. I can imagine you together on screen already. You would make a great pair, for sure. I just hope to see this very soon. Also, a special request to you to return quickly as we are missing you on screen. One of the best ways to spread positivity is through words, so tell me something positive and uplifting? @heena_IBQuotes – In a day, there are 1,440 minutes. That means we’ve 1,440 opportunities to achieve our goals and remember, every setback is a setup for a comeback. God will bring you better things. Stay positive. I appreciate all the blessings in my life including family, fans and friends. Tell me about some of the blessings in your life you really appreciate? @mebi31 – Thank you Surbhi ma’am, I am very ambitious and focused. For me, hard work has been the key to success. I have learned that our blessings also play a vital role in our endeavours and mine is my beautiful mother. She is a working woman who travels a lot. But she has managed to be with me on all my special occasions and has never missed a single one in these 21 years. She has always been my constant support and advisor in all my decisions. Her mere presence fills me with a lot of confidence. The most beautiful, strong, independent and wisest woman in my life, My mother is my most precious blessing. @Sakshi_KTweets – My idea of happiness is seeing my parents happy and healthy. Trekking and travelling give me an experience of true happiness. For me – cold breeze, snow-covered mountains, rough trails, green valleys, a sky full of stars, a flowing river and silently looking at the beautiful glow of fading sun splashing on foggy clouds and mountains – they all give me inner peace.